Some of the nation’s foremost Constitutional scholars lay out the case exactly as it would be presented to the US Senate. Clear, concise, and powerful. In these highly-charged political times, it is the word that dare not speak its name: impeachment. Democrats and other opponents of the President, as well as people in the media, are afraid to raise the topic for fear of being called too partisan or extreme. But the startling revelation of the President’s warrantless wiretapping campaign may be the straw that broke the camel’s back: In the halls of Congress and on the front pages of a growing number of mainstream periodicals, impeachment is being discussed more and more openly. And many leading constitutional scholars agree: there has never been so strong a case for impeachment since Richard Nixon. In Articles of Impeachment Against George W. Bush Michael Ratner, Bill Goodman and other experts at one of our nation’s leading institutions of constitutional scholarship, the Center for Constitutional Rights, set out the legal arguments for impeachment in a clear, concise, and objective discussion. In four separate articles of impeachment detailing four separate charges -warrantless surveillance, misleading Congress on the reasons for the Iraq war, violating laws against torture, and subverting the Constitution’s separation of powers – it is, say the CCR attorneys, a case of black letter law, with abundant evidence. 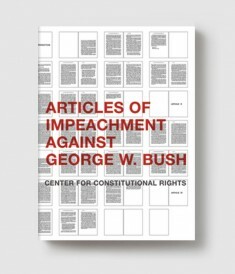 Articles of Impeachment Against George W. Bush details that evidence, the relevant laws and the legal precedents. 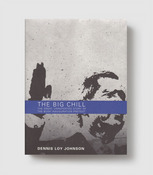 It also explains what the Constitution says about impeachment – an informative discussion further illuminated by supplemental material that includes a history of impeachment, explanation of its procedures, and the previous articles of impeachment brought against Presidents Andrew Johnson, Richard Nixon and Bill Clinton. With leading Republicans calling for investigations of the domestic spying campaign, a special prosecutor investigating the suppression of evidence used to launch the Iraq war, and hearings on innumerable instances of torture, Articles of Impeachment Against George W. Bush may be more timely than any of us would like to admit. Founded in 1966 by attorneys who represented civil rights demonstrators in the South, the CENTER FOR CONSTITUTIONAL RIGHTS is a non-profit legal and educational organization dedicated to advancing and protecting the rights guaranteed by the U.S. Constitution and the Universal Declaration of Human Rights. Most recently CCR has filed a case against the President and NSA for warrantless wiretapping.